Crossing the Mississippi | NJNA is Blogging! 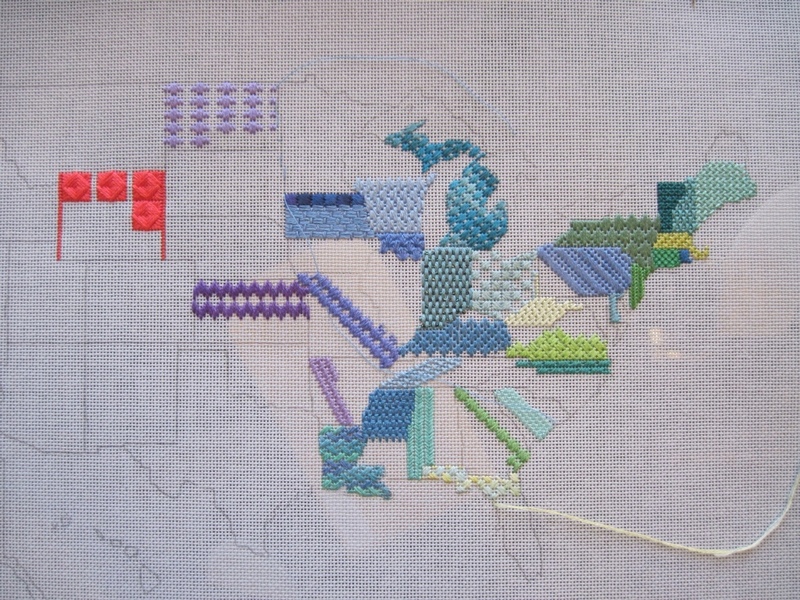 Today we did begin the westward journey across the Mississippi once we learned the stitch for Illinois. Much less compensation is needed with these states with mostly flat borders! You can see that we are moving away from the greens and into the blues and purples. Wondering why Wyoming is sitting out there by its lonesome? The design calls for the waffle stitch which is 9 threads square. Which means we needed to make the state a multiple of nine squares or find some way to accommodate extra stitches or threads. I took a canvas thread from Montana to help out and have put a row of tent stitches on the west and east borders as well as a slanted Gobelin between each column of waffle stitches. We did learn the stitch for South Dakota, but I decided to get another waffle into Wyoming instead of using the ten minutes we had for the Old Florentine which will go in South Dakota. Unfortunately, what I stitched for Nebraska had to be removed as I put it in the wrong place, it is pretty and will be stitched soon. It is apparent that some of our instructions tomorrow will have to be verbal as class does end at 4:30 and by that time most of us cannot even think straight. I did go to the well lighted but cold stitching room this morning at six to finish up a few threads and complete the Upper Peninsula of Michigan so I got off to a good start this morning with only a few loose threads! Last day of this class tomorrow.